Can I export accruals information? Once you have applied the Accruals feature to your account you will have access to Bizimply's Accruals Report. Select Reports > Employee Reports > Holiday Accruals. Select your locations/date range/export type. What information will this report show? Hours Worked - This value shows the hours this employee has worked for the date range chosen. Accrual % - As you can set a different accruals percentage for each employee, this value will show the percentage chosen for the employee in question. 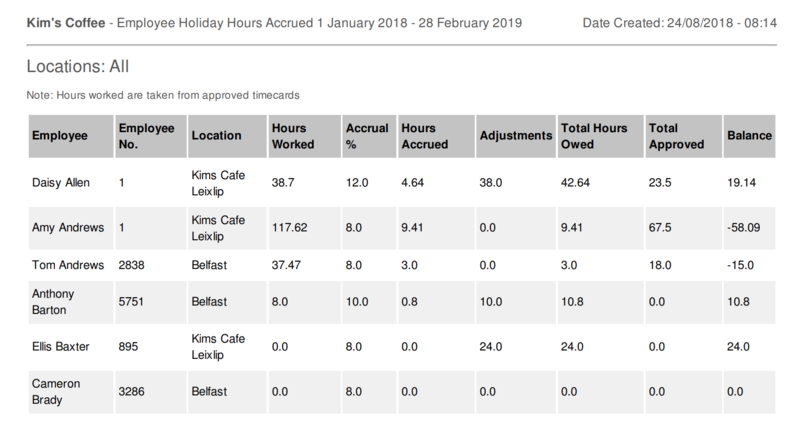 Accrued Hours - This value shows the number of hours the employee has accrued for the date range chosen. Adjustments - This value is the number of adjustments made on the employees time off section in their profile. Total Hours Owed - The value of hours accrued minus adjustments. Total Approved - The value of upcoming time off created. *Note, only upcoming time off within the date range specified in this report will show. Balance - Remaining balance. Total Hours owed minus Total Approved.